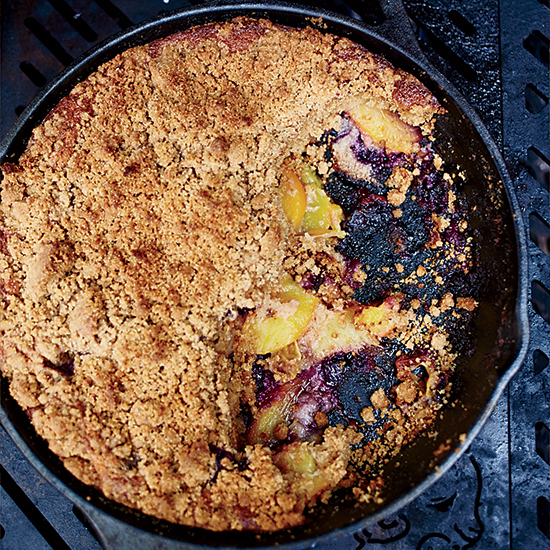 Yes, desserts deserve grill time too, and Stephanie Izard’s crumbly skillet cake is the perfect one. Shake up your campfire dessert routine with one of these. Another twist on s’mores: Replace the graham crackers with chocolate-studded biscuits. Cooked over a fire in foil packets, these supersweet nectarines are topped with streusel-esque crumbled gingersnaps. Grilling berries enhances their sweetness exponentially. Chicago chef Stephanie Izard’s skillet cake, baked on a grill, gets amazing flavor from graham crackers mixed into the batter and in the crumbly topping. This rustic apple dessert—a mixture of sweet and tart apples and buttery breadcrumbs—slow-cooks over hot coals.